They repeated this desperate cry over and over. I asked the Lord why so many felt as though He might let them down? His answer came in a scripture. 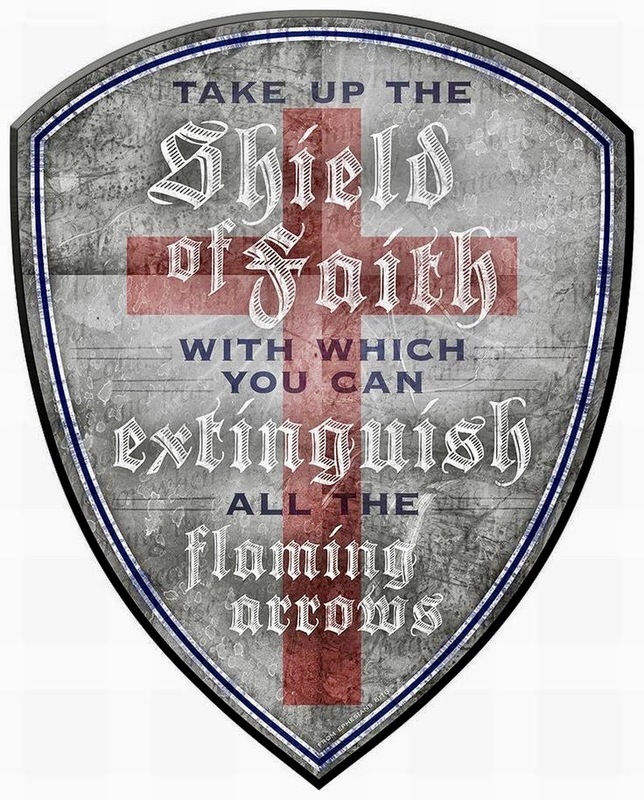 I immediately understood that their “shield of faith” had been lowered and that the enemy’s flaming arrows were not being extinguished but rather piercing their lives and hearts with fiery darts of disappointments. They began to believe that God was not protecting them and they began to expect disappointment. I began to pray for these ones who were being hit with the enemy’s flaming arrows. I prayed for their “shield of faith” to be raised again. It is like a picture of what we see in many science fiction movies such as Star Trek or Star Wars; if the enemy can lower your shield then he can hit his target. When the shields are up the enemy can not penetrate the shield or bring harm with his weapons. Many in the body of Christ have come under an attack that has caused them to lower their shield of faith. We must pray for the Lord’s people and even hold up their weary arms so that their shield may be raised again. If your shield of faith has been lowered and you have found yourself desperately calling out to God, “Don’t let me down.” Then turn your desperate cry into a shield of faith and begin to shout the declarations of His goodness and promises with gratitude and thanksgiving. He has promised you blessings, hope, joy, deliverance and salvation. He has plans to prosper and not harm you. This is not for just some of His people but all who are called by His name. Call upon the strength of the Spirit of God within you to help you once again raise your shield of faith. The Spirit of God, who lives within you, has not been weakened! Your soul may be downcast but as you put your hope in God you will experience the Spirit’s mighty power. This is a two-fold announcement; first it is to protect you from the evil one’s fiery arrows and second it is to position you for the prosperity of promises. I believe that we are in a 10:10 moment where we see the enemy very active in his pursuit to steal, kill and destroy but as God’s people raise their shields once again they will experience God’s purposes and promises. You must leave the place of living in the soul realm to living by the Spirit so that His mighty power at work in you will exceed your natural expectations. Lastly, I saw a vision of a someone licked the end of their index finger and put it up in the air in order to find out what direction the wind was blowing. Although this is a legitimate way to gauge wind direction this person found that the wind was blowing in every direction and it caused them to cower in fear. Then they were lifted above the Earthly atmosphere and they were standing in the Heavenly place where we are seated with Christ. Once again they licked the end of their finger to find the direction of the wind but there was none. It was completely calm and void of the winds that had blown upon them when they were in the Earthly realm. Peace filled them and they stood up in the strength of the Son. This is a time where the wind of chaos is blowing in every Earthly direction to stir up strife, disunity, demonic activity and terror. Though the enemy is declaring a bad report, God is calling His people to live from their Heavenly position and receive His good report. It is a 10:10 time to receive the redemption from all that the thief has come to destroy and to live in the safety of the Almighty. Ten is the Biblical number of completeness and divine order. Ten/ten is the double portion of that! We often ask people to rate an experience on a scale from 1 to 10 (1 being the worst and 10 being the best), as I saw these shields of faith go up I saw the bad reports over people’s lives in which they were rating their experience at a 1 suddenly go to a rating of 10! A new experience is awaiting you as the “shields go up”. Faith is the ASSURANCE of things hoped for! God is going to give you a life experience that you will rate a 10. There is joy for those in Christ, peace for those in Christ and a rich and satisfying life for those in Christ. If my words and articles have encouraged and blessed you, please consider sowing a financial gift. 2017 is an Ephesians 3:20 year for our ministry and for our supporters! We have heard many testimonies of breakthrough from our faithful supporters. Thank you! !